Cuantificación del polisacárido Vi en la vacuna contra la fiebre tifoidea VaxTyViTM mediante ELISA en sandwich utilizando un anticuerpo monoclonal. VaxTyVi® is a plain polysaccharide vaccine based on the capsular polysaccharide Vi (PsVi) from Salmonella Typhi, produced at Finlay Institute. Quantification of PsVi in VaxTyViTM, is a mandatory requirement for final product release and has being made by inhibition ELISA. Considering the disadvantages of this type of ELISA and that recently our group obtained a MAb against PsVi, the aim of this work, was to develop a sandwich ELISA to quantify PsVi in VaxTyViTM. M&M. Using MAb 4G3E11 as the capture and detection, a sandwich ELISA was developed. Limits of detection (LOD) and quantitation (LOQ) were calculated, as well as the inter- and intra-assay for each point of the standard curve. The PsVi content in six batches of VaxTyVi™ was also determined. Results. An eight-point calibration curve with a range from 50 to 0.39 ng/mL of PsVi was obtained with a coefficient of determination (R2) ≥0.99. The LOD and LOQ were 0.59 ng/mL and 1.25 ng/mL respectively, representing at least 1000 times more sensitive than inhibition ELISA. The inter-assay CV was 4–15%, and the intra-assay CVs varied between 3-8 % and 4–9% for intraplate and interplate respectively. The PsVi content in all VaxTyVi™ lots were found into the accepted range (±30%). In summary, the proposed sandwich shown to be specific, reproducible and highly sensitive. The assay shown to be suitable for use in the quantitation of PsVi in VaxTyViTM, with great potential to replace the inhibition ELISA, implanted in the Finlay Institute since 2006. VaxTyVi® es una vacuna simple polisacárida basada en el polisacárido capsular Vi (PsVi) de Salmonella Typhi, producido en el Instituto Finlay. La cuantificación de PsVi en VaxTyViTM, es un requisito obligatorio para la liberación del producto final y se ha realizado mediante ELISA de inhibición. Teniendo en cuenta las desventajas de este tipo de ELISA y que recientemente nuestro grupo obtuvo un MAb contra PsVi, el objetivo de este trabajo, fue desarrollar un sándwich ELISA para cuantificar PsVi en VaxTyViTM. Utilizando el MAb 4G3E11 como captura y detección, se desarrolló un ELISA en sandwich. Se calcularon los límites de detección (LOD) y la cuantificación (LOQ), así como el inter e intra-ensayo para cada punto de la curva estándar. También se determinó el contenido de PsVi en seis lotes de VaxTyVi ™. Se obtuvo una curva de calibración de ocho puntos con un intervalo de 50 a 0,39 ng / ml de PsVi con un coeficiente de determinación (R2) ≥ 0,99. El LOD y LOQ fueron 0.59 ng / mL y 1.25 ng / mL respectivamente, lo que representa al menos 1000 veces más sensible que ELISA de inhibición. El CV inter-ensayo fue del 4-15%, y el CV intra-ensayo varió entre 3-8% y 4-9% para intraplaca e interplate, respectivamente. El contenido de PsVi en todos los lotes VaxTyVi ™ se encontró en el intervalo aceptado (± 30%). En resumen, el sandwich propuesto demostró ser específico, reproducible y altamente sensible. El ensayo demostró ser adecuado para su uso en la cuantificación de PsVi en VaxTyViTM, con gran potencial para reemplazar el ELISA de inhibición, implantado en el Instituto Finlay desde 2006. In Cuba, there has been an increasing tendency to decrease morbidity and mortality from typhoid fever, describing two stages in the epidemiology of the disease: before and after 2002. Before 2002, an average of 178.4 cases reported per year, with a rate of 1.9 per 100 000 inhabitants. Since 2002, we observed a significant decrease in the incidence of the disease, coming from six cases per year to be no reports of the disease in 2013. 3 Figure 1. Figure 1. Behavior of FT in Cuba. 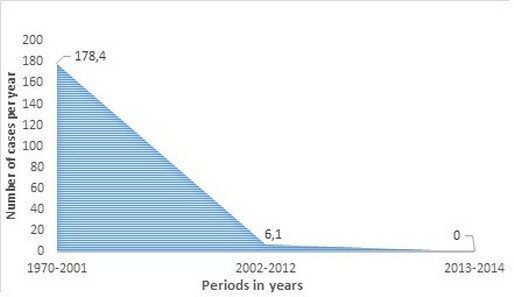 The average number of annual cases of FT shown in different periods: before 2002, from 2002 to 2012 and from 2013. Recently our group obtained a MAb against PsVi coded as 4G3E11, with high purity, affinity and specificity confirmed. 12,13 The high specificity and affinity constant of the MAb 4G3E11 suggests its use as an analytical tool in enzyme immunoassays. The aim of the present work was to develop a sandwich ELISA to quantify the PsVi in VaxTyViTM and thus replace the ELISA inhibition assay, considering the disadvantages mentioned above. The following buffers were used: coating buffer (15 mM Na2CO3, 35 mM NaHCO3, pH 9.6), PBS (140 mM NaCl, 2.7 mM KCl, 10 mM Na2HPO4, 1.8 mM KH2PO4, pH 7.4), blocking buffer (PBS, 3% non-fat dried milk), washing buffer (PBS, 0.05% Tween 20 (v/v), pH 7.4), and substrate buffer (35 mM citric acid, 67 mM Na2HPO4, 0.012% (w/v) H2O2, pH 5.0). All reagents were obtained from Sigma-Aldrich (USA). Purified MAb were conjugated in-house to horseradish peroxidase type VI (HRP) as described by Wilson (1978). Briefly, 8 mg of MAb was coupled to 4 mg of HRP and was purified by gel filtration chromatography. Conjugates containing 1% BSA, 0.05% thiomersal and 50% glycerol were stored in small aliquots at −20 °C. In the absence of International Standards, calibrators consisted of purified PsVi produced at Finlay Institute (Havana, Cuba) and used as internal controls (IC). PsVi concentration was quantitated using colorimetric Hestrin’s assay. The IC was supplied as lyophilized powders with 100 μg of PsVi. A two-fold serial dilution of IC was used to generate an eight-point calibration curve with a range from 50 to 0.39 ng/mL. Ascent software Version 2.6 (Thermo Labsystem Oy, USA) was used for plotting the optical density (OD492) against PsVi concentration and four-parameter logistic equation (4PL) was applied to obtain the function describing a sigmoid model. The quality control (QC) consisted of PsVi powders (Finlay Institute, Havana, Cuba) which were weighted, dissolved in PBS and adjusted to a final concentration of 5 ng/mL (w/v). Calibrators and QC were stored as single ready-to-use aliquots at −20 °C. Six VaxTyViTM vaccine lots (9006, 0004, 402, 203, 304 y 405) released by quality control department, with known concentration of 50 µg/mL determined by ELISA inhibition, were evaluated. All VaxTyViTM lots were provided by Pharmaceutical Development Direction of Finlay Institute and were used at dilution of 1:10000, taking into account the standard curve range. Polystyrene microwell plates (Maxisorp, Nunc, USA) were coated with 10 μg/mL of MAb 4G3E11 anti PsVi, in coating buffer (100 μL/well). After overnight incubation at 4°C, the coated plates were washed three times and blocked with blocking buffer for 1 h at 37°C. The calibrators, QC and samples were added (100 μL/well) and incubated 2 h at 37°C. Subsequently, the wells were washed three times and peroxidase conjugated MAb 4G3E11 diluted 1:2500 in washing buffer containing 1% non-fat dried milk, were added to the wells (100 μL/well) and incubated for 1 h at room temperature. After four washes, 0.4 mg of OPD per mL of substrate buffer was added to the wells (100 μL/well) and following 30 min of incubation in the dark, the reaction was stopped with 1M H2SO4. OD was measured at 492 nm using a Microplate Reader (Multiskan Ex, Thermo LabSystem, USA). Unknown concentrations were calculated using Ascent Software Version 2.6 (Thermo LabSystem Oy, USA). The calibrator, QC and samples were run in triplicates unless otherwise stated. Three independent experiments were performed and results were expressed as mean of PsVi content. Optimal dilutions of MAb and HRP conjugated MAb were determined by standard checkerboard titrations according to the procedures described by Crowther and Walker (2009). Lower limits of detection (LOD) and quantitation (LOQ) were determinated and defined as the mean of blank values (n = 20) plus either 3 or 10 standard deviation (SD) respectively. Intra-assay precision was determined by interplate and intraplate precision as calculated by the coefficient of variation (CV). The interplate precision was evaluated by measuring triplicates of standard curve on four distinct ELISA plates on the same day in parallel experiments. The intraplate precision was evaluated by measuring the standard curve in quadruplicate on a single ELISA plate. The inter-assay precision was determined as the CV on five separate occasions. MAb 4G3E11 was used as the capture and a peroxidase conjugated MAb 4G3E11 was used for detection in a sandwich ELISA assay. An eight-point calibration curve with a range from 50 to 0.39 ng/mL of PsVi was obtained (Fig. 2). A four-parameter fit model was applied to obtain the function describing a sigmoid model. Coefficient of determination (R2) ≥0.99 was obtained. Figure 2. Calibration curve obtained from sandwich ELISA using the Ascent™ Software Version 2.6 (Thermo LabSystem Oy, USA). A four-parameter logistic equation (4PL) was applied to obtain the function describing a sigmoid model. Error bars represent standard deviations of quadruplicate samples. The assay reproducibility and repeatability was determined by precision assay, calculating the inter and intra-assay expressed in CV% (Table 3). The proposed sandwich ELISA was used to measure the PsVi content in six lots of VaxTyViTM (summarised in Table 4). As shown in Table 5 all lots of VaxTyVi™ evaluated show concentrations of PsVi determined by the sandwich ELISA within the accepted range (± 30%) according to the product specifications (35 to 65 µg/mL). In this manuscript, we describe the use of a simple sandwich ELISA for the quantification of PsVi in VaxTyViTM. The proposed sandwich ELISA that use the MAb 4G3E11 for coating and the same MAb but conjugated to peroxidase, for detection, shown to be specific, reproducible and highly sensitive. However, despite the high sensitivity and reproducibility of the proposed sandwich ELISA, was important to demonstrate the application of the assay, in quantify the amount of PsVi present in VaxTyViTM, and it was done. Six lots of VaxTyViTM were evaluated using the developed sandwich ELISA. All vaccines lots have an expected nominal label amount of 50 μg/mL of PsVi and all of concentrations obtained through sandwich ELISA, were within the accepted range (±30%) of PsVi according to the European Pharmacopoeia guidelines. 15 The CVs were <4% compared to the acceptance criterion of <15% CV for immunoassays. In ELISA inhibition, the CV obtained were between 4.7% and 12.3% for an average of 7.7%, higher than the sandwich ELISA but also within the acceptance criteria. In summary, the assay described here has been shown to be suitable for use in the quantitation of PsVi in VaxTyViTM, with great potential to replace the inhibition ELISA, implanted in the Finlay Institute since 2006. 1. Romero, R., (2007). Microbiología y parasitología humana. Salmonella. Ed. Médica Panamericana. ISBN 6077743542. 3. MINSAP., (2013). Anuario Estadístico de Salud. Dirección Nacional de Registros Médicos y Estadísticas de Salud. Edición 42, Editorial MINSAP. 6. OMS. (2003) Manual de entrenamiento: concesión de licencias, liberación de lotes y disponibilidad de laboratorio. Vacunas y productos biológicos. 7. Voller A, Bidwell DR, Bartlett A. (1979). 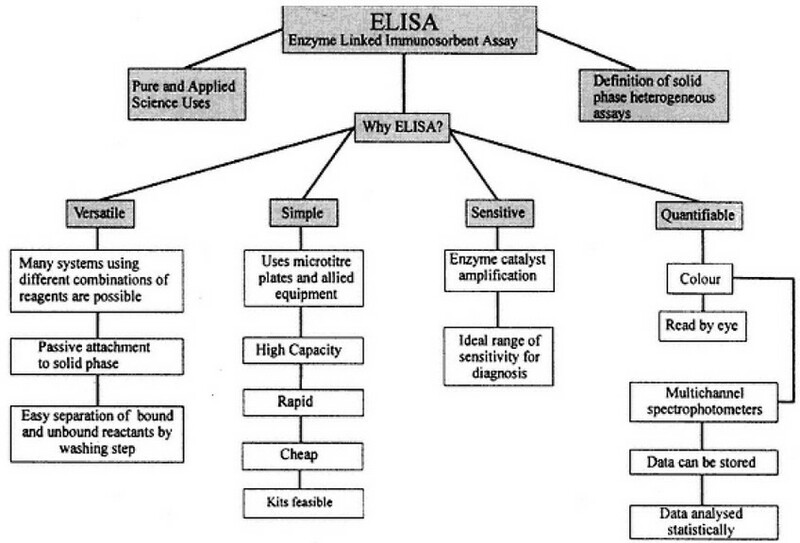 The enzyme-linked immunosorbent assay (ELISA). A guide with abstracts of microplate applications. Dynatech Europe, Borough House, Guernsey GB. 9. Crowther J. (2002). The ELISA Guidebook. METHODS IN MOLECULAR BIOLOGYTM. Huangzhiman 2002.12.18. 11. Reyes F. et al. (2014) Development of four sandwich ELISAs for quantitation of capsular polysaccharides from Neisseria meningitidIs serogroups A, C, W and Y in multivalent vaccines. Journal of Immunological Methods. 11834; No of Pages 5. 13. González E. y col. (2015). Producción, purificación y caracterización del AcM contra polisacárido capsular Vi de Salmonella Typhi y su aplicabilidad en ensayos de identidad. Revista BioProcesos. Vol.1, No.3. 14. Ochoa RF. (2013).Técnicas inmunoenzimáticas en el desarrollo clínico de vacunas. Finlay Ediciones;. p.3-13. 15. European Pharmacopoeia. (2002). Typhoid polysaccharide vaccine.4th Edition, Version 4.2, 07/2002:1160. 16. CECMED. (2000). Requisitos para la liberación de lotes de vacunas. Regulación No.19. 17. World Health Organization. (2013). 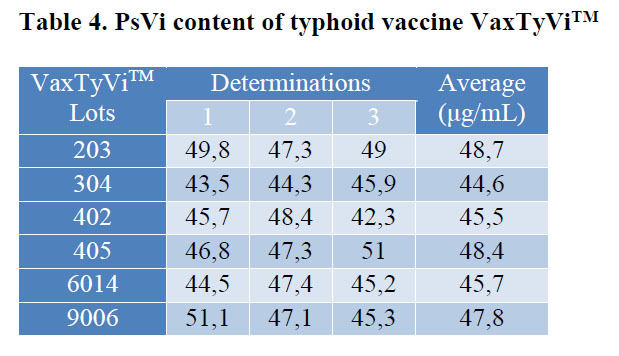 Guidelines on the quality, safety and efficacy of typhoid conjugate vaccines. Adopted by the 64th meeting of the WHO Expert Committee on Biological Standardization, 21-25 October. 18. Hestrin S. (1949). The reaction of acetylcholine and other carboxylic acid derivatives with hydroxylamine, and its analytical application. Journal of Biological Chemistry, 180:249–261. 19. Lemercinier X. et al. (2000). Use and validation of an NMR test for the identity and O-acetyl content of the Salmonella typhi Vi capsular polysaccharide vaccine. Biologicals, 28:17–24. 20. Stone AL, Szu SC. (1988). Application of optical properties of the Vi capsular polysaccharide for quantitation of the Vi antigen in vaccines for typhoid fever. Journal of Clinical Microbiology, 26:719–725. 21. Micoli F et al. (2011). Vi-CRM 197 as a new conjugate vaccine against Salmonella Typhi. Vaccine, 29:712–720. 23. Bartlett JW. and Frost C. (2008). Reliability, repeatability and reproducibility: analysis of measurement errors in continuous variables. Ultrasound Obstet Gynecol 2008; 31: 466–475. Filiation: Laboratory of Monoclonal Antibodies from the Biological Evaluation Department, Research Area, Institute of Vaccines Finlay. Havana, Cuba, A.P. 16017, Cod. 11600.